We all had a fantastic experience – it was intense, spectacular and we all worked hard. It is amazing to have a scientific vision and then be able to make it come into being with the support of so many resources and people. We were able to collect the largest seismic imaging data of any volcano on Earth. Now to the intensive work of processing and analyzing this wealth of information. The R/V Marcus Langseth approaching a drifting seismometer in the Santorini caldera. The R/V Marcus Langseth working in Santorini’s caldera. The island of Santorini in the eastern Mediterranean is the source of Earth’s largest super-eruption in the past 10,000 years. To investigate the structure beneath this picturesque but active volcano, a four-week-long seismic expedition was recently completed by the United States of America (USA) Research Vessel Marcus G. Langseth and a team of international scientists. The expedition’s goal is to understand the deep roots, or magma plumbing system, of an arc volcano. Near the surface the structure of volcanoes is well studied. However, the magmatic system that lies deep in the crust (10-20 km down) remains poorly understood and difficult to study. Santorini, besides being an idyllic vacation spot, is perfect for tackling the problem of imaging the deeper roots of a volcano. It recently experienced significant unrest due to magma recharge, including inflation of the ground and intense earthquake swarms. Since Santorini is a semi-submerged volcanic system, the scientific team could collect a very dense 3D marine-land seismic dataset using the seismic sound source of R/V Marcus G. Langseth – the most sophisticated seismic vessel in the world’s academic fleet. The expedition was extremely successful and the unprecedented data set will reveal the structure of the Santorini crustal magmatic system and its surroundings in 10 times more detail than any volcano on Earth. 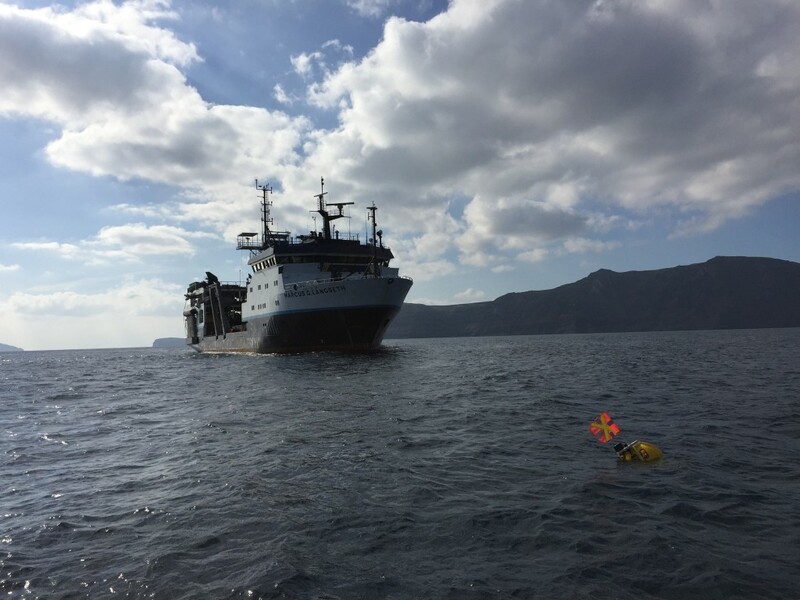 To achieve this goal, the scientific team dropped 91 specially designed seismometers to the seafloor and installed another 65 land seismometers on Santorini and the nearby islands. Together, the onshore-offshore network recorded the seismic source of the research ship over 14,000 times. The scientists will now begin analyzing the data, which requires many months of sophisticated processing. 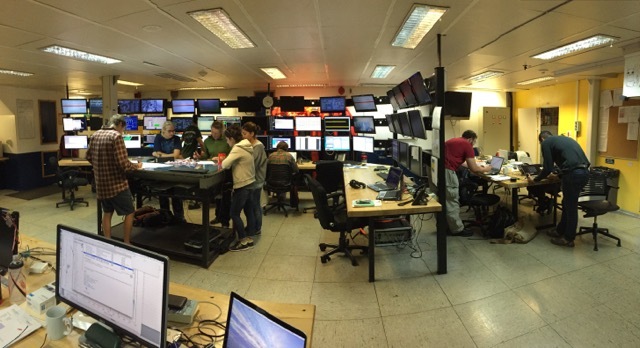 Scientists working in the main lab inside the R/V Marcus Langseth. During the ship’s transits around the volcano the scientists also mapped new regions of the seafloor. The structure of faults and landslides between the islands of Santorini and Amorgos revealed themselves each day. These measurements may help resolve the enigmatic occurrence of the largest 20th century earthquake in Greece (1956, M 7.5) and its accompanying tsunami. The international team of scientists includes Greek, British, and USA personnel. The project is led by Prof. Emilie Hooft of the University of Oregon, USA. The shipboard Chief Scientists were Profs. Emilie Hooft and Doug Toomey (University of Oregon, USA) and Prof. Paraskevi Nomikou (University of Athens, Greece). The onshore team included Profs. Joanna Morgan and Mike Warner (Imperial College London, United Kingdom) and Prof. Costas Papazachos (University of Thessaloniki, Greece). The National Science Foundation (USA) provided the majority of the expedition’s funding (~$3M US). The Greek and British scientists also contributed funding and resources. 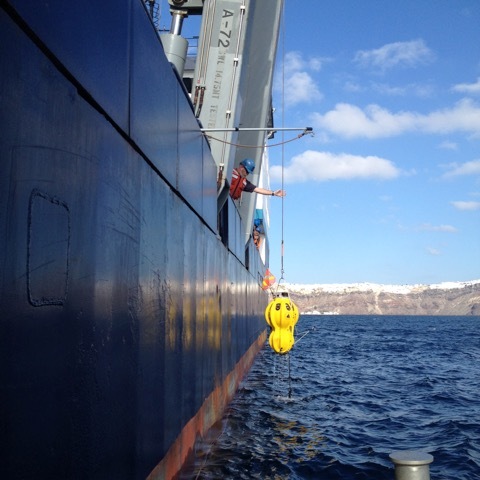 Retrieving an ocean bottom seismometer from the Woods Hole Oceanographic Institution withing Santorini’s caldera. The Lamont-Doherty Earth Observatory, USA, operates the R/V Marcus G. Langseth for the National Science Foundation. The seafloor seismometers are designed and operated by the Scripps Institution of Oceanography, USA, and the Woods Hole Oceanographic Institution, USA. 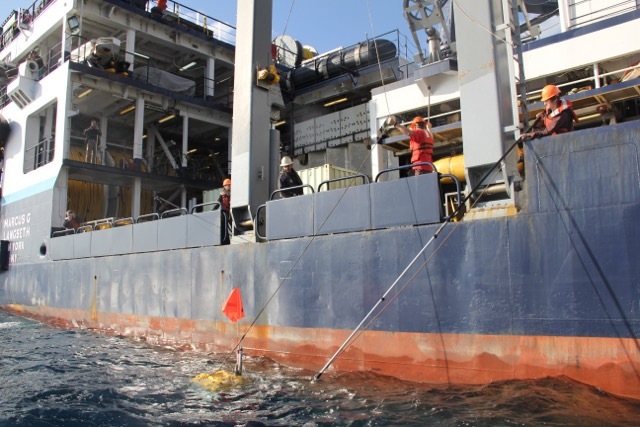 The Geophysical Instrument Pool at the German Research Center for Geosciences and the University of Thessaloniki provided the land seismometers. Retrieving an ocean bottom seismometer from the Scripps Institution of Oceanography.